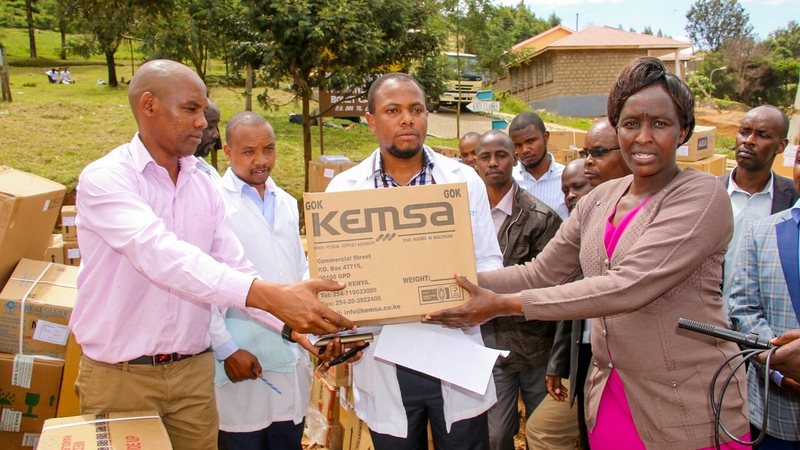 Bomet County Government Health and Medical Services department has received pharmaceuticals and non-pharmaceuticals supplies worth Ksh 34 million worth from the Kenya Medical Supplies Authority (KEMSA) at Longisa County Referral Hospital. Receiving the supplies, Medical Services Chief Officer Zaddy Chumo accompanied by the Director of Health Administration and Logistics, Dr Benard Sowek said the commodities will undergo quality, quantity and packaging verification before being dispatched to 132 health dispensaries in the county. She added that some will be kept in the buffer store for periodic orders by health facilities in case of shortage. The supplies will be safely stored and routinely supervised at all levels. Meanwhile, the CEC for Health Dr Joseph Sitonik has made assurance that the county is set to welcome two Cuban Doctors by July, 2018. “one endocrinologist and one family physician will arrive at Longisa County Referral Hospital by July 2018. The doctors will mentor and train county health workers on malaria vector control and management of HIV, hepatitis, and diabetes among other ailments. The county has send one doctor from Bomet to Cuba to be trained on family medicine” Dr Sitonik said. The County government through the medical services and health department is committed to improve health and medical services at all facilities across the county. It is in this regard that the County Government has increased budgetary allocation for medical drugs in the financial year 2018/19.